It is interesting to observe the immense effort put into styling and performance for small displacement, single-cylinder motorcycles in India. 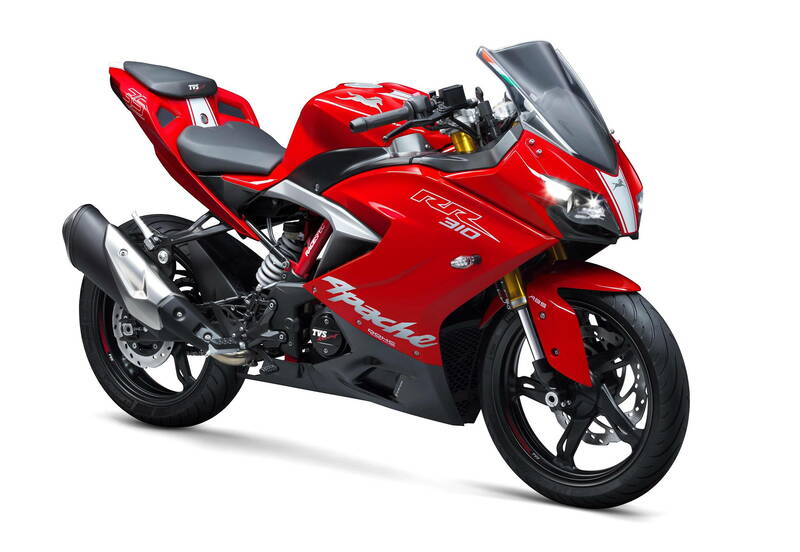 Introduced in India last week, the new TVS Apache RR 310 uses the same single-cylinder engine found in the BMW G 310 R, which MD reported on here. We find the styling, and detailing, quite attractive. In addition to the photos, there are a couple of videos below from TVS and an Indian motorcycle reviewer. The new TVS is lightweight, and puts out roughly 34 horsepower at the crank. If you are interested in additional details, you can visit the official TVS web site for the model. KTM AG is presently owned by CROSS KraftFahrZeug Holding GmbH (51,28 %) and Bajaj Auto India (47,99 %). Enfield sales have continued to grow in the domestic market, topping 700,000 motorcycles in the last 12 months. By comparison, Harley-Davidson sells 250,000 units each year globally, KTM sells 200,000, BMW sells 150,000 motorcycles, while Triumph and Ducati sell 50,000 each – all of them together just match Royal Enfield’s total output. India is the largest 2 wheeler market in the world. According to “India Premium Motorcycle Market Forecast and Opportunities, 2019”, the India premium motorcycle market is forecast to grow at a CAGR of more than 30% during 2014-19. High Net Worth Individuals (HNI) in the country are the key target customers for premium motorcycle player operating in India. Total number of HNIs in India are projected to increase by more than 115% over the next decade, thus portraying a very positive outlook for the premium motorcycle market in India. It appears that so long as the bike is marketed as being something other than from it’s place of origin, people will therefor think it is worthy of their hard-earned money. Just because Honda puts a decal on a Chinese made bike doesn’t somehow not make it from China, built by Chinese people, does it? If Kymco makes scooters in South Korea and BMW funds some models and then puts a Roundel on them does this now make them made in Germany by Germans and not in South Korea by hard working South Koreans? How about Triumphs assembled outside Great Britain? Only a person intent on self-delusion would think that. People used to belittle products “made in Japan” and with good reason. The same was true about the first Hyundai cars imported to America. But now Hyundai (which I believe is Korean for “modern”) makes excellent automobiles and like Japan are staunch allies of the USA. The next miracle of modernization will hopefully be from Russia with Urals improving with each passing year and quality/reliability reaching modern levels. Japan made its mark with quality small bore bikes that were anything but a bore. Here in America we don’t have a tiered licensing program so there isn’t an automatic demand for small displacement motorbikes. What then to do? Look at the resurgence of vinyl records and turntables for insight into what it takes to make something cool and by association, acceptable, popular and (for manufacturers and dealers) profitable again. To paraphrase Brian Wilson, it’s not a big bore but a groovy little motorbike. How bitchin’ is that? People need to quit their bitchin’ and learn that the world doesn’t revolve around them and instead get on two wheels and go for a ride to see the world that’s just outside their ego. Interesting quote from a guy that slams every motorcycle that comes with spoke wheels and a sub 5 gallon gas tank. Christmas spirit getting to ya? Mickey, Mickey, Mickey…It’s simply an ability to express oneself to the benefit of others. Call it writing versus typing if you will. You have no idea of the bikes I own or do not own. I have expressed my likes and my dislikes and that seems to upset some here, maybe even yourself, that can’t see beyond their own ego driven BS. Exempli gratia? Weight. A great many riders whine more about a bike’s weight than they do something like safety which tubeless does provide a measure of over tubes and yet I have yet to see anyone save myself point this silliness out here. Most of us could stand to lose some weight ourselves and yet we cry about weight as if we were carrying the bike instead of riding it. Note I said “us”. We’re all the same. Just people that in our case, enjoy motorcycling. And a fuel tank with enough range to get us somewhere far enough and back to actually call it a ride is important to people that do ride. If that makes a bike too heavy for some then I suggest you simply put less fuel in and stay closer to home. I don’t celebrate any holiday but I do celebrate life and just one of the ways I do that is by taking a ride on one of my bikes. If it happens to have tubes, I just don’t go that far from home in case of a flat. But I can assure you the tank on any of my rides is large enough that I can risk a flat to go a couple hundred miles nonstop. Smile, kiddo. Anything built in India has to prove its reliability before I would consider it as a viable alternative to a Japanese built machine. I’d tend to think that we’ll all be riding electric bikes before they build a quality bike on par with the best the Japanese have to offer. We said that about Japanese and then Korean cars (with terrible American cars all the while), than we said it again about Chinese goods. 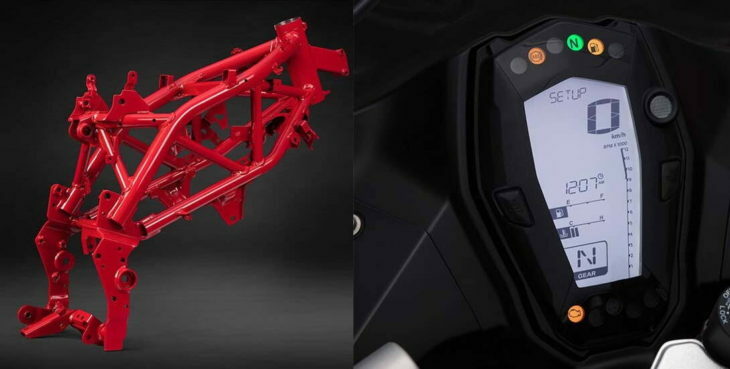 There are already several India made products out there – KTM 390, HD Street, BMW 310. Honda is building good scooters in Thailand and Vietnam, and good cars in Mexico. There’s no reason to believe these places can’t make good bikes. reliability. I’ll let others tesr Indian-built products with their hard earned money. The KTM, BMW and HD may be Indian made, but they are not Indian products. There is a big difference. That isn’t to say that Indian bikes won’t get there, of course. They could be at a high level already for all I know. Royal Enfield bikes are my only exposure, and that doesn’t mean that they are representative of the quality being produced by other manufacturers. I would argue that these are collaboration between Germany/USA and India/Korea. Design and definition are an important part of a product’s development, but engineering its production is also important and I don’t believe that any of these Western makes started from scratch there. Did you know that the Chevy Cruze was largely designed and developed by Daewoo and Opel? Is it a Korean/German car, or an American one? 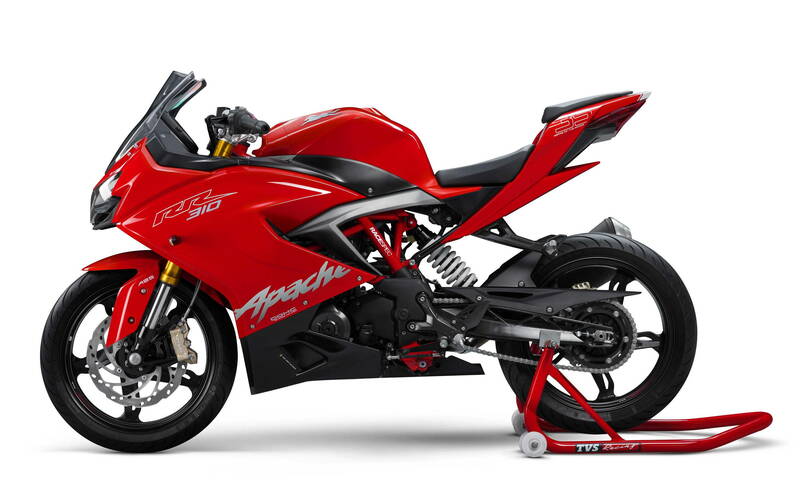 The TVS Apache looks to be a very nice bike. People don’t “need” a 410 or whatever next size motor up, their ego does. This bike has the same heart as the BMW 310? That just goes to show that BMW needs engineering help, not TVS. BMW scooters appear to be made for them by Kymco, if so why then do BMW scoots cost so much more to buy and maintain? The same could be said about this TVS Apache and it’s BMW twiin, the 310. Whether or not the TVS comes to the USA is, at this point, unknown. Well, it is here now as a BMW 310 but will this bike show up in Apache guise under the TVS banner or will BMW adopt it, raise the price and sprinkle Teutonic Pixie Dust (i.e. affix a Roundel sticker) on it thereby magically raising not only the initial buy in but also the overall cost of ownership? Hyosung’s GT250R is a bike that is having great difficulty finding buyers here in America. Perhaps if it was stamped with the Roundel of Holiness, it would see greater acceptance. Maybe not. Because after all, it’s just a 250. Those 300/310/320/399 cc models are where it’s at until some intrepid manufacturer makes the jump to 450cc and then 550cc and BINGO! BANGO! BONGO! We’re all left wondering why no one imports any good 250 motorcycles anymore. Again. And that’s because people think the bike makes them who they are. Nah. They’re not thinking at all, they’re feeeeeeling. Stupid people. Give them what they need and they stay away in droves because someone, somewhere convinced them that they couldn’t possibly be happy with being happy. If you look at the dirt bikes, because they have been performance singles forever, you’ll note that 400 is pushing it for a middleweight. When Honda made the XR400, it was a sort of an upper middle weight. They had a 200 and a 250 already. KTM 400s have long been based on their open class engines. Their 350 is very much like the 250 and not the 450, which uses the open bike infrastructure. I think that once a single gets beyond a certain size, it needs a stronger chassis to carry it. Balance shafts seem to bring a little wiggle room. But the big two balance shaft KTMs are still under 700cc. The traditional 650cc limit hasn’t been pushed very far. Even the parallel twins are seeming to stick to a 350cc max cylinder size. Suzuki used to make a 779cc single. That is a fairly good amount past the 650 mark. But at that point, an extra cylinder just starts to make more sense. Dirt bike chassis handle very powerful engines and can land from massive jumps over and over without breaking. I imagine they could handle more power. That bike weighed 400 pounds and had about as much power as a 450 four stroke or 250 two stroke dirt bike. It does have considerably more power than a KLR650. But it’s gone and the KLR remains. For that matter. The DR650 remains. You can make a really big single. But you can’t make people like it. Indeed they can. There was recently an effort to create a “super-mono” road racing class built on converted 450cc mx bikes. As for powerful, large singles, I have not ridden one but KTM’s 690 is supposed to be excellent. The Hyosung is a poor seller because it fails to deliver a compelling enough value proposition against even the Japanese 250’s, as well as a lack of distribution. If the BMW310 sells, it’ll be because it delivers the level of quality that BMW customers expect, which means at least as good as a Japanese competitor. I get what you’re saying about BMW scooters made by Kymco, but are they BMW’s made by Kymco, or are they Kymco’s with BMW logos on them? Both are possible, as any of the premium Japanese auto brands (Acura, Infiniti, Lexus) have shown. Sometimes a Lexus is nothing like a Toyota, despite being made by the same company. Actually, I feel that WSHart is right about Hyosung. It’s the perception from people that Hyosung is an “off brand” bike here in the US, where in actuality it is much more known in other countries. That’s easy to understand as Hyosung has only been in USA in any numbers since 2006. As far as distribution, they have quite a few dealers at least in the East. Name is more of a problem than performance or value, as they do cost less than Japanese brands, even though it may be a few to several hundred dollars depending on model. After all, their water-cooled GD-250R smoked all Honda CBR 250’s when it was first released in a Korean road race. Name perception changes quickly with performance, value and availability. All a brand must do is *deliver*, which is far easier said than done. The more I look at this bike, the more I’m impressed with it! It looks like a Ducati! It’s a small displacement bike, but it doesn’t appear to be built to “budget” specs. It’s like someone set out to build the best 300cc motorcycle they could!Looks better than anything being offered currently from Japan or Germany or Austria (KTM?) for sale in the US. If this bike is a joint venture with BMW, I hope they bring it to the US AS IS with a BMW sticker. With all due respect to TVS and admission of a good deal of ignorance on my part as to their manufacturing/technical prowess, I have to wonder how much of this motorcycle is perhaps the by-product of a BMW-TVS venture. It just looks too polished to be something that just sprung out of a little-known company outside of the Indian subcontinent. To my eyes it’s the best looking bike in it’s class and the frame design appears to be something other manufacturers may try to emulate. page 11 top right, the BMW-TVR partnership. Page 16 bottom, building manufacturing infrastructure in USA. page 75, converting “rupees in crones (one crone = 10m rupees and one rupee = $0.15 USD, I get about USD $2b revenue, compared to $6b for Harley. Wild guess, probably 10 times as many bikes as Harley. Rapid growth and a bright future. Their press release describes the market segment for this bike in India as “super premium” and I believe it. They also show 100cc bikes with semi modern styling and drum brakes in front. and small scooters. They make 3 wheelers for African market but note low foreign exchange reserves in that continent lead to low sales. It does appear to be a leg up on RE for example in its finish quality. Good to see. I’m sure both companies are benefitting greatly. TVS from BMW’s technical expertise and understanding of premium user experience, and BMW from TVS’ knowledge of supply chain and production efficiency. It was former Toyota engineers who saved Porsche back in the early 90’s by reimagining their production practices. Thanks for that information about Toyota and Porsche. I didn’t know about that, but read a NY times article on your suggestion. Very interesting. …and it was Yamaha who stepped in, friendly wise, for the Mr2. Oops that has 4 wheels. No grinding evil point here. Nice relationships are a good thing. The bike looks real good. To buy in USA then ride, lets see. I was thinking old Triumph 600. Yup, Daytona 600 for sure, with some paint and graphics details cribbed from Ducati. Overall, though, I like the look and design! I’d gladly take one for a spin! It’s admittedly a good looking bike. Whether it could make it in the US market is certainly a question. Unless BMW is going to service it, dealer support will be an issue. As will competition. BMW does currently service and sell this same bike (without fairing) in the G310GS. This is the same bike. If this bike comes to the US it will arrive as a BMW. Is it just me, or does anyone else think it weird that an Indian firm has chosen the name of an American Indian tribe for a model name? Yeah, it hit me too. Are they paying homage to NA aboriginals? If it was “real Indian” name it would be probably Arjuna. ….and they have the nerve to put the Italian flag on the fairing. It’s a good looking bike though. where do you see an Italian flag on this bike?? The Green/White/Red accent stripe on the wind screen, I think he’s referring to..
ah, I see now. That IS sneaky. Thanks Dave. Looks like orange, not red, on that stripe on the side of the windshield. India’s flag is orange, white, and green. That makes more sense. It’s probably not Ireland, eh? i thought this was supposed to be called the Akula…? which is a pretty cool name considering, not many things better than a Russian attack sub skippered by Tupolev. They’ll be afraid to bring it to the US because it isn’t a 410. This has almost as much power as the cult-classic DRZ400SM, it should be a hoot, but now that Kawasaki raised the bar (yet again) it looks like there’s no hope for anything less than 400cc now. Looks pretty impressive! Great styling. Nice details! …and it is “middle class” in India. Here it would be like ‘grownup kid’ bike. Reverse inclined engine?? I like the looks, but what about dealer network here in the states?? If the India-based company would throw some $$$ in advertising like “Indian” did at Bike Week, they may have an audience. Would be interesting to slap some Yamaha (or Honda, or Suzuki, Kawasaki) stickers on the tank and let folks test ride it…..thinking it was a Jap bike. Wonder what their reaction would be?? Just watched the “engine video”……see their website. Very interesting. The intake is in the front of the engine utilizing Ram Air Technology. Does this engine have it’s air intake in the front on the BMW? Q: Reverse inclined engine?? A: yes. re: “intake is in the front of the engine utilizing Ram Air Technology” A: yes. While this particular bike is not for an old guy like me, it does show how quickly Indian manufacturers are accelerating their design and workmanship. It appears to be a quality bike that should have great appeal to young riders, something that our sport can use more of. Once large numbers of Indian-made bikes start showing up here in the US, American buyers will demand that they are equal to what we are used to getting from Europe and Japan. That day should come soon, and the innovation and competition hopefully will be good for our marketplace. That can only be a good thing. And Indian buyers, who probably outnumber American buyers 1000 to 1 will demand that bikes remain cheap, and that is what we will get. There was a time when the US was the primary market for motorcycles, and consumer trends and opinions here could drive design and quality. Now, India and China are those markets, and I don’t think we will see some of the quality improvements you speak of until those big Asian markets start demanding (and paying for) them. I get your point, but with manufacturers like BMW involved with Indian companies, we may get some positive fall out. This bike looks light years ahead of what India was cranking out a decade ago. I’m still hoping for the best. I think this bike, and many of the premium Japanese and European brands making bikes,and selling them into, India and Southeast Asia are a fairly strong indication that these markets are demanding and paying for them. These are surely more expensive than Hero or Bajaj products in those markets? It is expensive by Indian market standards. Royal Enfields are much more expensive than your typical motorcycle for sale in India also, but the quality is still pretty horrid from the last examples I’ve seen. I confess this bike looks beautiful and we’ll finished in photos. But then, I thought the same thing about the RE’s. Like Motowarrior, I am hopeful. But I’ll have to see it to believe it. You think that maybe they could have found a couple more places to weld another few more tubes on that frame? Lol, just what I was thinking! Only to cover it up with all of that (admittedly, pretty good looking..) bodywork! Fairly masterful job of hiding the tiny swing arm, too. This thing is a quantum leap better looking than most of the India market small sport bikes that I have seen. it does look intense. it’s apparently the same frame as the BMW when you look it up on the parts fiche you see it’s nearly identical. BMW just dresses it up different using the plastic frame pieces simulating ally bits. not sure who did it first, but this is same technique as Kawi’s done on the Z900 (no not that one, the Transformer one). Not an inexpensive frame to manufacture. Interesting to see whether they import it here and if they do, how much it will cost. The frame strength look’s like they could offer a lifetime time warranty against cracking. About $3200 in New Delhi. Probably $4000 (landed) in New York. Not bad for the “legendary motorcycles of Germany”. Q: How can we improve on insipid bar graph tachometers? We’ve obviously crossed over and digital readout has become less expensive than old analog needle gauges. I miss needle gauges. Probably $10 vs $12. I’d gladly pay the difference for analog gauges – even if the markup was $100. Same thing in the car world- screens replacing needles..the kids think it is cool, I don’t. Not all kids. My daughter (mid-20’s) refuses to own a car with a screen, and turns mine off when she drives it. Of course she also rides a late ’60’s Honda CL … as for this bike, my impression is that the frame could be weight-reduced by 50% without losing stiffness or strength. Digital has been cheaper for a very long time, probably since Casio made it big in the 80s. The crossover you speak of happened in consumer preference.